Get the guide for everything you need to know about offboarding employees. Offboarding employees doesn’t have to be complicated. Use our offboarding checklist to ensure a seamless transition. If an employee is resigning from a job, you might be overwhelmed at finding their replacement... much less thinking about the logistics to ensure a smooth departure. Just as the onboarding experience matters, the offboarding experience is important both for the employee leaving and the company at large. 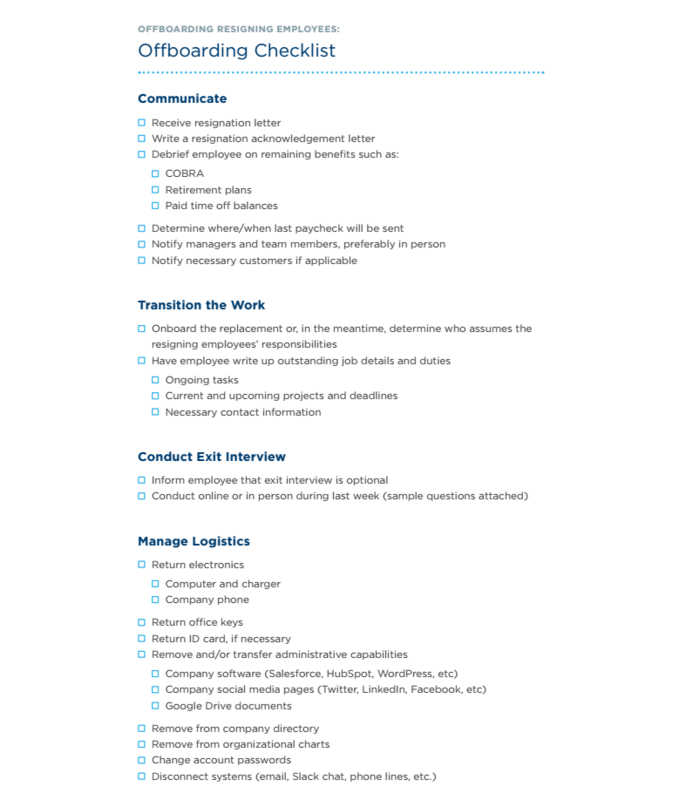 That’s why we’ve created this one-page checklist you can print out and use once an employee has resigned from work. Educate the departing employee. An employee who knows what to expect will feel more favorable towards the company than someone who wasn’t walked through the financial logistics. Explain how benefits like remaining 401(k) balances or COBRA plans will work. Set the stage for their replacement. What does the next person need to succeed in the former employee’s role? First, give your departing employee the resources to hand off tasks while a replacement is found. Second, conduct an open and comprehensive exit interview as soon as you can after the employee’s resignation notice. The exit interview will give them an opportunity to describe successes and shortcomings of their position, and set a clear path for the next candidate. Close the loop on office operations. By offboarding properly, you’ll ensure your former employee doesn’t have access to information he or she no longer should. It also means transferring computer permissions employees need to continue your former employee’s work. Build trust and long-term value. A comprehensive offboarding process shows your employees — both current and former — that you support their opinions and career development.